Alexia Tarabotti, spinster, is a preternatural, born without a soul, which fact makes her a rather useful weapon against werewolves and vampires. The problem is that being a weapon = violence, and violence has a nasty habit of ruining treacle tarts. And if this soulless state weren’t enough, Miss Tarabotti also has to suffer the indignity of having two airhead sisters and an even sillier mother, not to mention a father who is both Italian and dead. It’s enough to make a girl hide in the library. Unfortunately, libraries seem to be a poor choice of hideaway, and before too long Miss Tarabotti has killed a vampire (accidentally, of course), which means that Alexia has to deal with BUR and its supernatural liaison, the infuriating Lord Maccon. Soon Miss Tarabotti is thrust right into the middle of a very messy mystery. And this is only the beginning; what follows will take her to Scotland and beyond. It’s a good thing she has plenty of tea. 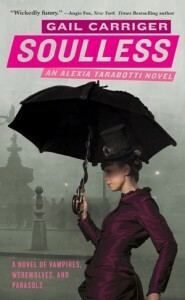 Soulless, Changeless and Blameless are the first three books in The Parasol Protectorate by the fabulous Gail Carriger, whose love of steampunk and tea colours a beautifully imagined Victorian England. Her writing is bright and witty, and the books themselves are rollicking good fun. No, they really are. They remind me gloriously of Georgette Heyer and Oscar Wilde and Jane Austen and many other very good things. With vampires, werewolves and ghosts thrown in. The characters are utterly lovable (except when they’re not meant to be). Alexia Tarabotti is saucy, smart, and has more backbone than something with a lot of backbone. [She also reminds me of our very own Camilla - well, apart from the backbone thing. ]. Lord Maccon is all that a debonair Scottish werewolf should be, and I really want my own Professor Lyall. And a pair of glassicals. Then there’s the gorgeously attired Lord Akeldama, who knows absolutely everything and is extremely good at annoying Lord Maccon, and Miss Tarabotti’s best friend: Ivy-of-the-terrible-hats. On the surface, Ivy is rather nonsensical, but there’s a lot more to her than her social personality. This layering is typical of the characters Carriger has dreamed up. And of course there’s Floote, the world’s best butler and a man of few words. Never flustered, Floote is a figure of calm in the ever-increasing maelstrom of Alexia’s life. The supporting cast is to die for: mad scientists, French inventors, dour Scotsmen & women, adorable fops, and possibly the most wonderfully arrogant Major I’ve ever read. (I think he’s my new hero.) They’re not stereotypes either. Each one has something a little different that makes them feel alive. Apart from a geographical error or two (which can be explained away by the fact this is an England that’s rather different from the one we know), the setting is well realised. Steampunk Victorian London makes a lot of sense, of course, and the changes in history to accommodate a society now accepting of the supernatural are subtly done. There’s still unease amongst the Daylight folk, but with the pragmatism of the British they take vampires and werewolves in their stride, and naturally change their habits to suit the night’s children. As long as there are tea and sandwiches, a person can handle anything. Happily, European stereotypes remain well in place, and provoked quite a few chortles throughout. I also loved that BUR is not explained (unless I missed something, which isn’t incredibly unlikely). It’s quite nice to feel that we should know what that means. It helps make this alternate England feel more real. These books are great fun, and will certainly become frequent rereads. Even though I guessed the ending of the second book, when it came it made me cry, and that’s quite an achievement for what is, on the whole, a very funny story. I very quickly developed affection for the characters, and Carriger’s writing is at its best in emotive situations. I know you’re thinking that the whole vampire/werewolf thing has been done to death, but be openminded. They’re not like the majority of supernaturals that have been out and about recently. Carriger’s given them some very nifty innovations while retaining their proper menace, and they make for a very good read. Oooh, and the covers are pretty, which all covers should strive to be. The first is my favourite. I think it really suits Miss Tarabotti’s character. There’s really only one thing I don’t like: it’s going to be difficult to wait for the fourth, which is due next year. Those months better go by quickly! Soulless, Changeless and Blameless are published by Orbit. Heartless is due in April next year.